Bassui: “You are unable to dismiss lingering habits simply because you are not looking into your own nature. If you clearly penetrate this truth of seeing into your own nature, arousing the great prajna wisdom and realizing that all names and forms are illusion, you will never again have feelings of attachment to either existence or emptiness. Hence it is said in a sutra: ‘When you know it as illusion, you are at that moment separated from it and have no need for any expedient means.’ If you try to remove lingering habits that come from attachment to form, not yet having seen into your own nature, you are like one in deep sleep trying to rid himself of a dream. The desire to rid oneself of it is itself a dream. The knowledge that it is a dream is also nothing but a dream. As for completely waking up from this sleep, no matter how much you seek something within a dream you will never attain it. If you truly believe in the living Buddha, the Buddha becomes the King of the Law that destroys existence. The Buddha said: ‘All karmic paths are like dreams, illusions, bubbles, and shadows; they are like a dewdrop or a flash of lightning—thus shall you think of it. ‘The dharma talks of the living Buddha are like this. If you don’t believe these words, even your claim to believe in the living Buddha is based on delusion. Attachment is like being sucked-into a long slithering worm that swallows all manner of conditioned phenomena as it crawls through the mud of samsara’s vicissitudes. Worm-food! There is no escape from the worm’s belly as long as one’s authentic Buddha-nature is not recognized. One will simply remain indistinguishable from all manner of the phenomenal as it passes through the worm’s intestinal wall. The way out of this horror is to penetrate through the wall with the Clear-Light of the Unborn Mind. This penetration is a breakthrough from forms of illusional as well as delusional episodic-existence. 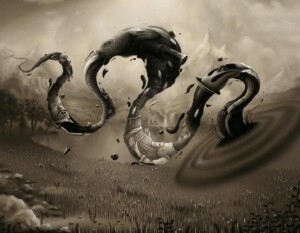 However if one tries to break-free from the worm utilizing mere skandhic-impedimenta, all efforts will prove futile. It would be like trying to escape from an endless dream, a diurnal nightmare! The senses are tools of Mara and one best learn fast not to depend upon or trust in them. They are no more able to pierce the belly of the worm than an entrapped maggot. Even belief in a living-Buddha will not free you lest, you too, take-up Manjushri’s imageless-sword and slay the beast! Bassui asserts that one also remains bound to the ‘spirit of attachment’ and is therefore unable to free oneself from this malignant-force that carries many across eons of time on the karmic-winds of transmigration through the six realms of impermanence. He says that even stringent ascetic-practices will not be enough, in and of themselves alone, to transcend phenomenal existence if one’s attachments remain unchecked. It’s like having one foot leaning towards the shore of nirvana and the other one chained to the Herculean-rocks of samsara. Trying to live in harmony with the Unborn while still anchored to formal-realms is another ineffective enterprise; Bassui’s metaphor is quite apropos: it’s like trying to produce fire by striking a rock lying on the bottom of the ocean floor. The murky depths of the phenomenal quagmire will always inhibit one from direct Self-Realization. Bassui states that all have the proclivity to Self-Awakening provided that the right spiritual chord is struck, the precise confluence of notes that break the spell of aggregated existence. While not being held spellbound to phenomena is key, it’s also interesting how Bassui interjects a dire warning not to disrespect Buddhist images and sutras, lest one suffer ‘severe punishment’ by desecrating the hidden Reality that these Buddhist forms represent. And yet that also is key—‘honoring what they represent’ and not the formal-images in-themselves. The point is never to grasp phenomenal projections as somehow being sacred or even as ordinary means to enlightenment—this includes attempting to cultivate a false-self center while turning-inward in meditation. The end does not always justify the means in this instance. Just look directly at THAT which IS beginning-less and has no end. This entry was posted in Mud and Water: Bassui Zen and tagged attachment, delusion, dream, form, phenomena. Bookmark the permalink.